Interviews can be nerve-racking especially the first one. Getting butterflies in the stomach, those weird dreams about the Interview and sleepless nights are common. My first interview was for Jet Airways and I still remember dreaming about the interview each night and yes, they were not the good ones of course. Those were the real nightmares. A night before the interview I, dreamt of attending the interview without wearing shoes. Firstly, let us answer the question that comes to mind when going for an interview. Though, it is important to look presentable in an interview however an Interviewer is not going to select or reject you based on what you wore. The presentation does matter, however, don’t over think. Wear formal neat and well-ironed business attire, neatly combed hair, clean socks, polished shoes and smell good. Keep it Simple, Yet Professional. During my first interview, I concentrated so hard on what to wear that I spent half of my time shopping and other half matching the accessories with it. I did not concentrate well on the most important part of the interview preparations. Yes! Preparation plays a major role in a successful interview. It is the most important factors. Preparing an introduction and researching about the company and the industry is equally important. Even though you are a fresher but basic knowledge is a must when appearing for an interview. Knowing about the organization and industry are an added value. Not only this, read the job posting carefully. Most of the interview answers may be hidden there. Read the job description and skills required and include them in your answers smartly. This can help you answer the interviewer that why should he hire you. Practice and prepare yourself. Since it is your first job interview, do not over with your resume. Remember there are certain dos and don’ts for a resume to look professional. Font size should be considered. Don’t use bright colors for highlighting. Choose your resume layout carefully. Updated and correct information should be mentioned in the resume. Few, suggestions for fonts would be Arial, Times Roman, Georgia, Calibri and preferable font size is fourteen for the headline and twelve for the description. Avoid Capitalization and use of the bold letter. Apart from above, you need to understand the different types of resume. Though, a resume can be designed in various styles. 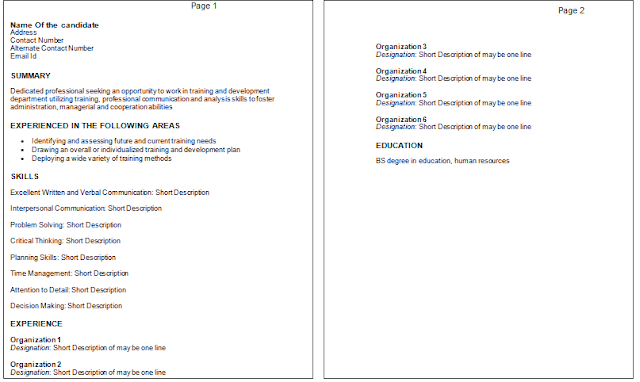 However, there are 3 types of formats for the resume. Chronological Resume is for those who have a strong work history. This may not be ideal for newcomers. Functional Resume focuses on skills more than experience. This type of format is for those candidates who have less experience, frequent job changes or gap in the career. 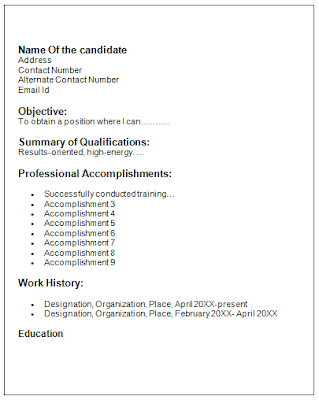 Combination Resume It is a combination of Chronological Resume and Functional. In this skills are lighted at the top and work history below. Though work history is not the highlight of the Resume. Please note these are only the samples to explain the types of Resume. The writing style in actual will differ. If you add you your photo ( I recommend adding it), make sure that it is passport size in formal uniform with the proper background. Don’t include something you don’t know. Example many times I have noticed that candidates add reading as their hobby and when asked which was the last book they read? They go blank. When carrying a hard copy of resume along with you for an interview remember it should be printed on clean and crisp paper filed properly. At no time display poor body language in an interview. Though body language is a vast topic, we will here discuss the basic yet important points related to it. A smile is very important. Know the right amount of smile. A smile is important but you should not fake it. Maintain right sitting posture even while waiting for your turn in the waiting area. If your handshake with the interviewer make sure that it is strong and firm one. Maintain right amount of eye contact. Don't stare. Feeling nervous in an interview is normal but do not let it show on your face. Yes! Your body language can depict that you are feeling nervous. Some examples are shaking your hand, fidgeting with an object or pen. I am going to break this sub-heading into few situations or questions. How to handle a situation when you don't know an answer? It happens many times that we go well prepared for an interview but the interviewer puts on a question for which the answer is not known to us. What to do in such situation? Wait, don't panic. An interviewer put you through different situations to understand you and it is perfectly fine to not to know something. If you come across a situation where you don't know answer firstly, don't panic, stay calm. Do not react immediately and don't let it show on your face. Maintain the calm and confident composure. 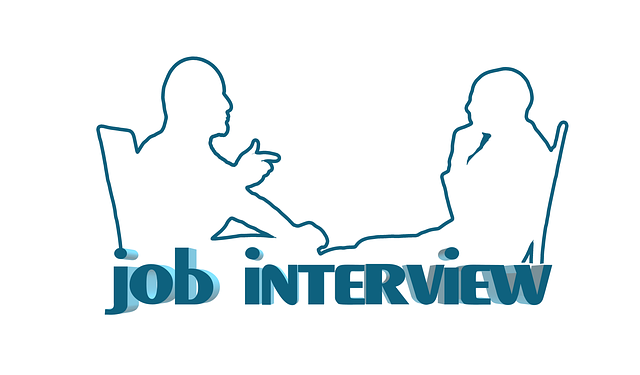 Buy sometime from the interviewer by asking clarification on the question. Maybe you know the answer but you might not have understood the question correctly. Still, if you don't know the answer accept it in a smart way by saying something like, " I am unaware about it, however, can I take some time to consider it and get back to you." Remember to research on it later and if you meet the interviewer again or maybe talk to him include the answer in your conversation. How do I answer a negative question? I am not saying you lie about it but answer smartly. Do not talk negative nor talk negatively about someone. I would never hire a backbiter. Being enthusiastic is good but too much talking can backfire. same way talking too less won't help either.